. . . tell anyone about your anxiety without fear of judgment or repercussions?
. . . freely discuss your feelings of depression?
. . . support others going through similar difficulties with the swipe of a finger or the click of a button? 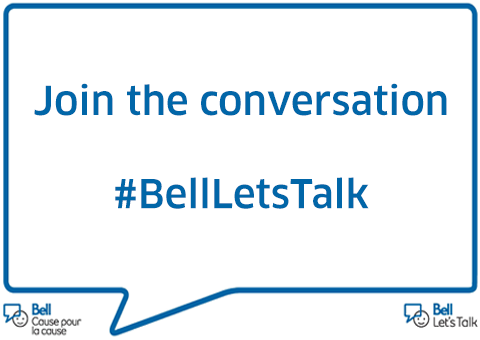 Well, this week you can — thanks to Bell Let’s Talk Day, the world’s biggest ongoing conversation about mental health. For each text message, mobile, and long-distance call made on January 30 (before midnight) by customers of Bell Canada, Bell Aliant, and Bell MTS, Bell donates five cents, plus another nickel for every #BellLetsTalk tweet and each view of the Bell Let’s Talk Day video on Instagram, Twitter, Facebook, or Snapchat. Bell Let’s Talk is a significant fundraising enterprise. Last year’s campaign alone generated nearly $7 million, and since its inception in 2010 the program has raised more than $93 million for mental health programs across Canada. One of the targets for that funding is the Mental Health Commission of Canada’s Standard for Psychological Health and Safety of Post-Secondary Students program. For the uninitiated, this Standard will provide guidance on protecting the mental health of post-secondary students through awareness, promotion, prevention, intervention, accommodation, and training. It will include the perspectives of caregivers, francophones, Indigenous peoples, and persons with lived experience and their families and will offer benchmarks to ensure post-secondary campuses are meeting the baseline for psychological safety. Implementing the Standard will be voluntary, but it will be available free of charge to anyone involved with post-secondary mental health: students, colleges, universities, polytechnic institutions, CEGEPs, staff/faculty, and unions. Essentially, it will encourage students to seek help with personal issues and reduce the age-old stigma around mental health. Let’s face it, the late teen and early adult years can be tough. Whether it’s the challenges of newly found independence, peer pressure, or academic achievement, life can place a great burden on developing brains. On January 30, please do what you can to make Bell Let’s Talk Day a success. Pick up the phone, fire off a tweet or a text . . . or maybe two dozen. You’ll be helping to give our youth a new mental health standard — for today, tomorrow, and every day after that.